“They didn’t even know if it would start a chain reaction that would move into the atmosphere and vaporize the joint.” From When did we have Sauerkraut? by Peter & Lou Berryman, a song pondering uncertainties in defrosting the refrigerator and detonation of the first atomic bomb. Friday, June 30, Bort Meadow, In the Gloaming — Time to build a fire that first evening of Kehilla’s Great Retreat. Riley and I had the task, and were provided a box of firewood. The smaller pieces were about two inches in diameter, and dense. No starter there. But no worries, at least not initially. Near the fire pit was plenty of dry grass, golden in color. Twigs lay on the ground. Eucalyptus trees stood nearby. We piled on grass, twigs and then dry eucalyptus bark, knowing that if the lore held true we would ignite a reaction that would turn our camp into a giant fireball, and end the retreat, not to mention our existence, from the outset. The grass ignited quickly, and the twigs too. Strands of the Eucalyptus bark caught fire, but the flames soon died. Anna to the rescue, providing us with Fatwood sticks that set all the wood aflame. Sure, it could have been different. Riley, like so many others, even at his young age, believed Eucalyptus to be highly combustible and dangerous — gasoline trees, as some detractors like to refer to these foreigners, who immigrated to our shores 150 years ago. If any part of the Eucalypts would burst into flames, their dry, dead bark would seem most likely to explode. Nonetheless, I had doubts. 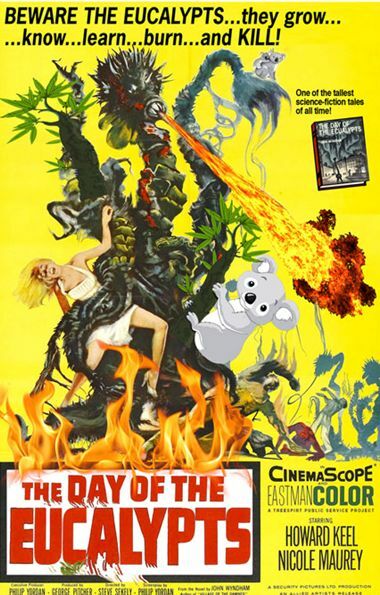 The exploding tree lore arises in the context of a long and bitter campaign by the East Bay Chapter of the Sierra Club and the Claremont Canyon Conservancy to clearcut hundreds of thousands of Eucalyptus across the East Bay hills and poison their root systems for up to 10 years running. It is lore that has spurred an effort to spend nearly $6 million in Federal Emergency Management Agency grant funds to destroy Eucalypts on land owned by U.C. Berkeley, the City of Oakland and the East Bay Regional Park District. UC, which long has had plans to build more housing on land in the hills targeted for Eucalypt catastrophe, hopes to proceed with the devastation this month even if a lawsuit by the Hills Conservation Network succeeds in blocking the FEMA funding. The lore also arises in context of chemical industry drives to persuade us that poisons must be applied to protect ourselves from non-native “invasive” species, like the Eucalyptus, and the Monterey Pine, which Nativists contend belong in Monterey, not in the East Bay. Acacia trees are also targeted for destruction in their drive to make our beautiful East Bay hills pure, poisoned, scorched by the sun and allegedly firesafe. The Nativists deem Bay Laurels to be non-aliens and, thus, ok, even though the oil content of their leaves is about twice that of Eucalyptus leaves, so they burn brighter, faster and hotter. I also had doubts about the danger of explosion because a day before the retreat, a brush fire broke out by Grizzly Peak Boulevard. Dan Grassetti, director of the Hills Conservation Network and a resident of Claremont Canyon, took pictures. The Eucalypts remain standing, green and tall, a striking contrast to the surrounding burnt vegetation, just as they survived unscathed in a fire that swept through the Scripps Ranch subdivision just north of San Diego in 2003, leaving rubble and charred remnants of the homes on both sides of a long street, along with unscathed Eucalypts. A few days before the Grizzly Peak blaze, Grassetti led a tour organized by Kehilla’s Greening Committee, first of UC Berkeley’s Site 29 in Claremont Canyon, where thousands of Eucalypts were clearcut and their root systems poisoned some eight years ago, resulting in tall, golden dry grass by Claremont Avenue along with thistle and French Broom — vegetation ready to combust in case a careless passenger flicks a cigarette from the car. After more than 3,000 Eucalypts were destroyed at and near Site 29, the Claremont Canyon Conservancy planted more than 1,000 Redwood seedlings in the hope that native vegetation would take root. Very few survived. Conditions just weren’t right in the bright sun and the parched soil. Across the road from UC’s Site 29, a hiking trail winds through a forest of Eucalyptus, which thrives alongside abundant vegetation, including Bay Laurels. No monoculture here. In contrast, Site 29 felt dead, dry and hot. There were no sounds other than planes overhead and cars passing by. On the trail across Claremont Avenue, birds were singing. The forest felt alive. That may soon change. Even if the Hills Conservation Network succeeds in stopping the use of FEMA funds to destroy the trees, U.C. Berkeley intends to use its own money to cut the Eucalypts down and poison their roots. Grassetti’s HCN plans to file another lawsuit, alleging UC’s project violates California environmental laws which require an in-depth Environmental Impact Report prior to destruction. For now, across the road from Site 29, the Eucalypts still grow, providing shade and moisture, breaking the wind and reducing the danger of fire, in keeping with the U.S. Forest Service comments in 2013 on FEMA’s destruction plan. The Eucalypts also still shed bark. That doesn’t deter the birdsong. Come see for yourself. Kehilla’s Greening Committee has organized another tour on Sunday, August 7 at 4pm of the relatively barren Site 29 and the forest across the road above it. Join us. Site 29 is well marked by a round sign 1.5 miles above the Claremont Hotel on the downhill side of Claremont Canyon Avenue. Both Site 29 and the forested hills are worth a look. Whatever you do, see the results of deforestation first-hand. Join us on the August 7 tour, and ask your own questions. The tour is remarkable, combining elements of ecology, politics, history, psychology, and the power of myth. You won’t be sorry you took it. Meanwhile, plan to make it to Kehilla’s coming Great Retreat 2017. Take fire-pit duty, and see for yourself whether you can vaporize the joint with carefully placed Eucalyptus bark and a match. 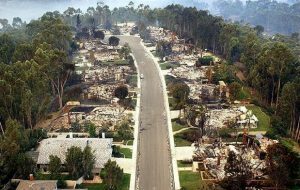 A N.Y. Times picture of devastation to homes, but not to the Eucalpyts, at Scripps Ranch.